Beckov castle is one of the most beautiful castles in Slovakia. The castle ruins are situated on a rock above the village of Beckov in Trencin Region, western Slovakia only a few kilometres from Nove Mesto nad Vahom town. The castle belongs to the National Cultural Monuments of Slovakia. 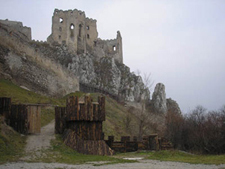 Beckov caste was built in 13th century over a settlement site that had existed from the Great Moravia Empire. In the times of Matthew Csak of Trencin the castle was owned by the powerful ‘Lord of the river Vah and the Tatra Mountains’. In the 1388 Matthew Csak gave Beckov castle to Stibor, Polish knight and founder of the Stibor family. Stibor was the second most important owner of the Beckov castle and Stibor dynasty became one of the most influential in the Hungarian Kingdom. Stibor rebuilt the castle including the castle wall, towers and built a new Gothic palace with a chapel. The fortifications turned out to be very useful in 1599 during the Turks invasion when the castle was successfully defended. In 16th – 17th centuries Beckov castle was owned by the Banffy family. The Banffy family rebuilt the original Gothic style castle into a Renaissance palace. After the death of Banffy family the castle was abandoned and in 1727 it was destroyed by fire. For many years the castle was visited by many artists, painters, scientists and constructors. Castle Beckov is formed by castle ruins and gardens. The castle is open for public and is very easily accessible from the village Beckov. You can park your car just below the castle at the village church which is about 5 minutes walk to the castle. The bus stop is also nearby. The path to the castle is very well maintained with very mild ascend. It is suitable for small children, elderly or parents with baby prams. Beckov castle is very attractive also thanks to its location and accessibility. In the village, you can buy something to eat or park your bicycle. You can visit the Beckov castle all year round, however some parts of the castle are available only during the summer period, from May till October. According to a legend, the castle was built in a very short time, the castle jester made every passerby work on the castle for 8 days.